Russian President Dmitry Medvedev said on Tuesday Moscow had recognized an independent Palestinian state in 1988 and was not changing that position adopted by the former Soviet Union. But on his first visit to the Israeli-occupied West Bank as Russian head of state, Medvedev stopped short of making a ringing declaration of recognition of Palestinian statehood by the Russian Federation that he represents. At a news conference with Medvedev in Jericho, Palestinian President Mahmoud Abbas said: "We remember that Russia was one of the first states in the world to recognize the state of Palestine in 1988." Medvedev responded, saying: "Russia made its choice a long time ago ...we supported and will support the inalienable right of the Palestinian people to an independent state with its capital in east Jerusalem." The Soviet Union recognized a Palestinian state in 1988, after it was declared by the late Yasser Arafat in a move that won broad support in the Communist bloc and Third World but had little real impact on diplomatic and political realities. Medvedev also expressed his willingness to take on a greater role in the peace process. "Everyone - the Palestinians and Israelis - will benefit from the establishment of a Palestinian state. The region will benefit all the Middle East nations will benefit. This is the goal we should aspire to," he said. The Russian leader said Moscow would grant the Palestinian Authority $10 million in aid. Abbas called on Israel to halt settlement contraction and resume direct negotiations. Earlier, Nabil Shaath, Palestinian President Mahmoud Abbas' senior advisor, told the London-based Arabic-language al-Hayat newspaper that the Russian president would ratify Moscow's recognition of a Palestinian state, stressing that it was a historic event. The Foreign Ministry in Jerusalem, whose workers have been on strike for three weeks now, tried to confirm the report but was forced to issue a statement that it was unfamiliar with the information. "If such a move has taken place on the part of the Palestinians and the Russians, it must have been in the past few weeks, and such information has not been received by the Foreign Ministry. In this process, like others, we are simply blind and have no idea what's going on," a knowledgeable source told Ynet. Following Arab reports, Foreign Ministry officials contacted their Russian counterparts, who disassociated themselves from the reports. "The Russian president has no plans to change the 1988 decision and has now plans to raise the subject either," one of the sources told Ynet. However, a Foreign Ministry official raised the possibility that the issue would be brought up by the Palestinians themselves or in questions presented by reporters. In such a case, Medvedev is expected "not to deny that this is their stand, which has not changed." Several countries have already recognized a Palestinian state within the 1967 borders, including Argentina, Brazil and other Latin American states. A Russian recognition of a Palestinian statehood would be a harsh blow to Israel, as Russia is a member of the International Quartet and such a move could lead to similar announcements from many other countries. 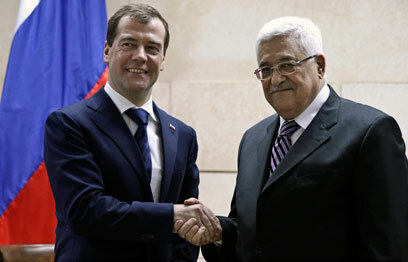 Earlier Tuesday, Medvedev was greeted warmly by Palestinian President Abbas. Chief Palestinian negotiator Saeb Erekat referred to the Russian president's visit as "historic", adding that "this is a message to the world that the Palestinians are ready for a state and for independence, that we are ready for freedom." During the visit, Medvedev and Abbas are expected to sign agreements related to agriculture, sports and communications. Medvedev is also expected to inaugurate a Russian art museum in Jericho. "It's a beautiful addition to the city," Erekat told CNN. The Russian president is also expected to visit Jordan and enter Israel through the Allenby Bridge for additional meetings in the West Bank. After he cancelled his meeting in Israel following the Foreign Ministry strike, the ministry's workers threatened to disrupt his visit to the PA and stop him from crossing the Allenby Bridge. The army and intelligence community's intervened and came up with a way for Medvedev to cross the border without going through the Foreign Ministry. See all talkbacks "Medvedev reaffirms Soviet recognition of Palestine "